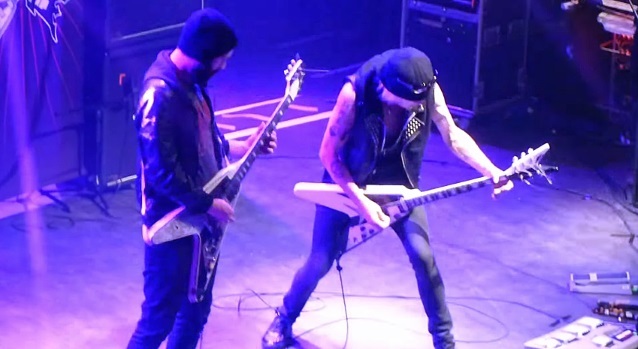 MICHAEL SCHENKER'S TEMPLE OF ROCK, the band led by legendary guitarist Michael Schenker, was joined by Michael's son Tyson on stage on December 20 at the O2 Shepherd's Bush Empire in London, England to perform the outro solo of UFO's classic song "Too Hot To Handle". Fan-filmed video footage of Tyson's appearance can be seen below. Tyson's band STATE VILLAINS was the opening support band for the MICHAEL SCHENKER'S TEMPLE OF ROCK show at the Shepherd's Bush Empire. MICHAEL SCHENKER'S TEMPLE OF ROCK next studio album, titled "Spirit On A Mission", is due in March. MICHAEL SCHENKER'S TEMPLE OF ROCK's last CD, "Bridge The Gap", marked the first time Schenker and fellow ex-SCORPIONS members Francis Buchholz (bass) and Herman Rarebell (drums) appeared on the same album since the classic 1979 SCORPIONS LP "Lovedrive".